Three aerial views show the phenomenal growth of Victor’s Camden, NJ, complex in the ‘teens. Dates top to bottom are 1910, 1914, and 1916. 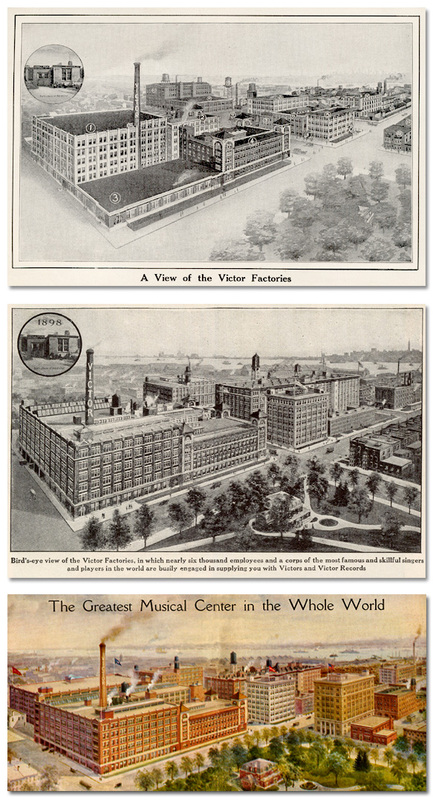 The modest structure in the upper circle is Victor president’s Eldridge R. Johnson’s original Camden workshop, where he got his start developing and manufacturing improved Gramophones for Emil Berliner. It was housed in the rear of a carriage factory at 108 North Front Street. Courtesy of John Bolig, author of The Victor Discography Series.